Not only is olive oil at the heart of almost every dish that comes from the Mediterranean, the oil is used by cultures in the region as body wash, perfume, medicine and lamp fluid. In the Roman era, the commodity was so important that olive oil was collected as part of provincial taxes. But just when did Italians begin squishing olives to extract the oil sometimes known as “liquid gold?” A new study of pottery fragments recovered from an archaeological site in Castelluccio, a village in the Apennine Mountains of central Italy, shows that oil was being produced in the region about 4,000 years ago. That pushes the timeline of the production of olive oil in Italy 700 years earlier than previously believed, reports Anne Ewbank at Atlas Obscura. The story of the discovery of the Bronze Age oil itself goes back two decades. That’s when archaeologists first uncovered the fragments of a jar in the Castelluccio site. 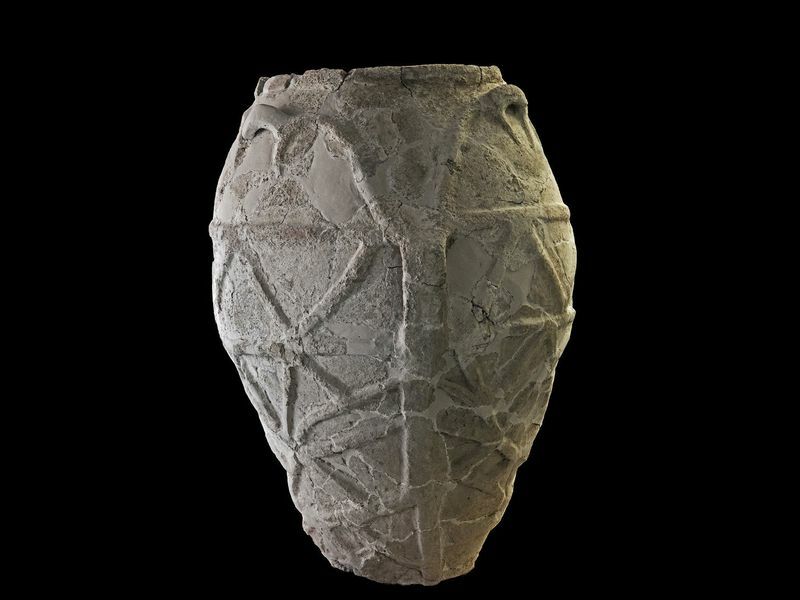 According to a press release, conservators from the Archaeological Museum of Siracusa pieced together some 400 fragments found at the site to rebuild a 3-and-a-half foot-tall, egg-shaped jar with rope-like flourishes. They also restored two basins separated by an internal septum, as well as a large terracotta cooking plate. Using gas chromatography and mass spectrometry, the team discovered residue of oleic and linoleic acid, telltale signatures of olive oil. Nuclear magnetic resonance testing then helped them determine the age of the oil. “The results obtained with the three samples from Castelluccio become the first chemical evidence of the oldest olive oil in Italian prehistory,” says Tanasi. According to Daniel Dawson of Olive Oil Times, storage jars dating back to the 12th and 11th century BCE in southern Italy’s Cosenza and Lecce previously held the record for holding the oldest traces of olive oil in Italy. While the ancient oil is a big deal for Italy, it’s only half as old as the world’s earliest extra virgin. In 2014, archaeologists in Israel unearthed shards of pottery a mile from the city of Nazareth, which contained traces of 8,000-year-old olive oil, the oldest ever discovered. While olive oil from the Bronze Age is long gone and would be rancid even if it did survive, it’s still possible to taste some olives from the far distant past. An olive tree in Bethlehem is believed to be 4,000 to 5,000 years old while the Olive Tree of Vouves in Crete, as well as several nearby trees, are believed to be 2,000 to 3,000 years old.